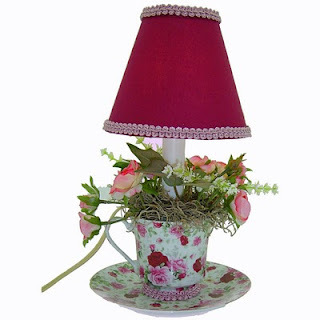 Handmade Maroon Teacup Accent Lamp. Sweet is the first word I think of when I look at this teacup lamp that I just made. The roses all over the ceramic teacup and saucer are accented by the pink silk flowers and white stem silk flowers that I've added to the teacup. I handmade the hardbacked, maroon fabric shade to match the deeper colored roses in the teacup base. It is clipped onto a 15-watt candelabra bulb on the electric candle that I also placed in the teacup. It has an on/off switch on the 6' ivory cord. Since it is only 10-3/4" tall, it will fit nicely under a cupboard in a kitchen.